Labor Day is just around the corner, which means it’s time to start planning a party. I have already posted several recipes for party foods, but this time I will share one that has been around for a while. It used to be very popular few years back, and it’s gaining popularity once again. Actually, one of my readers asked me to post my recipe for the Rye Bread Dip, so here it is. In a medium size bowl, mix mayonnaise and sour cream. Chop the Dried Beef to small chunks. Blend in the parsley, onions, dill and chopped beef. Scoop out the middle section of the bread, and cut up into 2x2 inch squares. The bread shell will become a bread bowl. 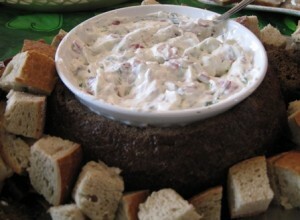 The sliced off top of the bread may serve as a cover for the dip before serving, or it may be cut up into chunks, for dipping. Set aside the bread chunks. Fill the bread cavity with the dip (see TIP below this post). Place the filled bread bowl on a serving platter, and arrange the cut up bread chunks around it. To prevent the "bread bowl" from getting soggy, you can place a serving bowl, filled with the dip, inside the bread cavity, and as begin to run low on the bread cubes, you can cut up the remaining bread, to replenish. To lighten up this recipe a little further, you may substitute the sour cream with Light Sour Cream, or Greek Yogurt. I told you I will post it for you, and kept my word. The corn dip is great as well. I occasionally find this page when just browsing some fashion pages, you must spend much time on your blog, these stuffs are very beautiful, where do you get them? I will keep a close eye on it, moreover, where can I find more quality blogs like yours? I am very pleased that you stumbled upon my blog and enjoyed what you read. I prepare my own posts, and take my own pictures. Lots of work, and still working on improving this skill. Please stop by any time, or sign in for emails to get all my posts.